If you recognise where this screenshot is taken from, good. If you don’t, you probably missed one of the best place to make money online in Malaysia. A cool RM3K is coming this month and also the next. I have made it a point to spend one third of my local income on me, myself, I every month. And I notice I have under-pampered myself because the credit card bill just arrived and I only spent RM1.3K on my credit card bills and most of them are purchases I made for groceries, books and stuffs for my sons. So, must make it a point to spend more on myself so that I have more motivation to make more money. I think I could make twice the amount if I have lived in KL because all the goodies go to KL bloggers. Penang bloggers are often passed over because we are not the cool and happening crowd. Another thing is some local advertisers hate me for my political stand. Not that I care, doh…..I won’t change the tune of my blog, everrrr to suit advertisers. Take it or leave it, I don’t really care. So how much have you made from this company? 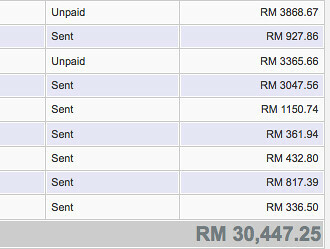 Now I am very curious to know where/what is the best place to make money online in Malaysia. It’s from Nuffnang isn’t it? wow.. u make huge from this company .. how many site you have? With the same amount of traffic, you’re getting more than Adsense from this program? congrats! how much time to reach 30K? That was great. I don’t think i can earn that much with that company. Hoho..
Liew – Since they start. But then, there was one phase when things were a bit slow because of the economy. Now more local companies are catching on and online ads are doing well again. melvin – It cannot be compared because most of mine came from advertorials or banner. I don’t use those pay per impression type. Advertisers either buy up the whole week or their ads don’t get shown. Hehehe, lansi a bit lah. its really big. I never reach that amount. Wow that’s awesome!I will be taking these tips and putting them to good practice as soon as possible. Terimakasi!!!! ehm..i guess that nuffnang, right? Its from nuffnang screen shot..
but actually you did have a good job..
I’ve been using google adsense and I also use CJ and Click Bank.